genuine verdict » Blog Archive » Honey, please check my wiring! Honey, please check my wiring! Pump motor, originally uploaded by trekr. The old pool pump motor gave up last week. I would’ve loved to have the local pool company fix it, but they wanted to redo the entire pool. I’m exaggerating, but only slightly. So I decided to fix it myself. Well, not exactly by myself. I had some help from my wife the electrical engineer, and my brother who has touched every piece of industrial air handling equipment ever made in the last two decades. All I needed was a little more knowledge to get the parts. A few Google searches later, and I’ve figured out the difference between a square and a C frame, a threaded vs. keyed shaft, high and low voltage motors, and how to match the impeller to the motor horsepower. I placed an order online and viola! 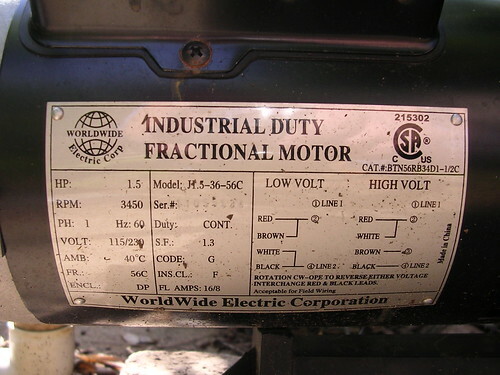 Two days later, Brown delivers me a Chinese made fractional motor at a fractional price. We’re off. Initially, I wired it up incorrectly, but a quick call to my brother and some QA from my wife and we are pumping ! No Yellow Pages, no driving all over town, no haggling, no hassles. This entry was posted on Thursday, April 19th, 2007 at 10:02 pm	and is filed under Home. You can follow any responses to this entry through the RSS 2.0 feed. You can leave a response, or trackback from your own site. Now you can fix everyone else’s in town too! Thanks for the credit….I think!…..SOME help? Ha. OK, you’re calling me out … Initially I wired it all a**backwards and nearly shut down the grid until my wife helped me read the wiring diagram!